There's a lot of effort going to save the Monarch Butterfly as its population declines and that includes finding out how and why they move from one place to the next. At Iowa State University, PhD entomology student Kelsey Fisher says, "The first question we're asking is to see, how far they can perceive so how far can they smell and how far can they see to get from one resource to another because if we're restoring habitat and putting milkweed out we want to make sure that the Monarch is going to be able to use it." Fisher is studying that by putting a tracking device on the butterfly, "This is a Monarch that we caught earlier. So we can just glue the transmitter and get the abdomen up and then we just hold it till the glue's dry." The Monarchs tend to weigh half a gram, the transmitters are a quarter of a gram, but that doesn't bother the Monarchs according to Fisher, We actually had a butterfly, it was a very small Monarch we were testing, the Monarch only weighed 0.3 grams we put a battery on it that weighed 0.3 grams. It flew away from us and we couldn't catch it." 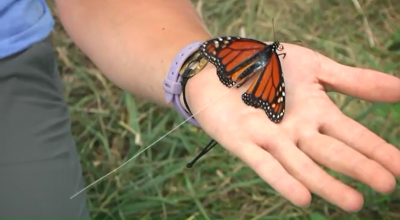 After putting the transmitter on, she'll track how it moves, "We will release the butterfly with a transmitter in the field and then track where it goes and then before it leaves the field, we'll catch it again." To sense it, four towers sit on the corners of about two acres. Together they triangulate the butterfly position. Fisher says, "In this, we're getting signal strengths, so we're getting numbers. So we can actually calculate where the butterfly was." Fisher counted the more than six thousand milkweeds in this field as one of several experiments. She says, "We're looking at how a butterfly is navigating in a field that is filled with resources." View the full story from David Geiger, WHO News.